Perhaps one of the few advantages of hitting 50 is being able to reflect on how much “working life” has changed over the past 25 years. It has been a period of unprecedented change and on a level exponentially more complex or rapid than that of my parents generation or those before them. Probably the biggest shift during that time has been in who’s responsible or accountable for Mr/s Employee – that’s you and me. 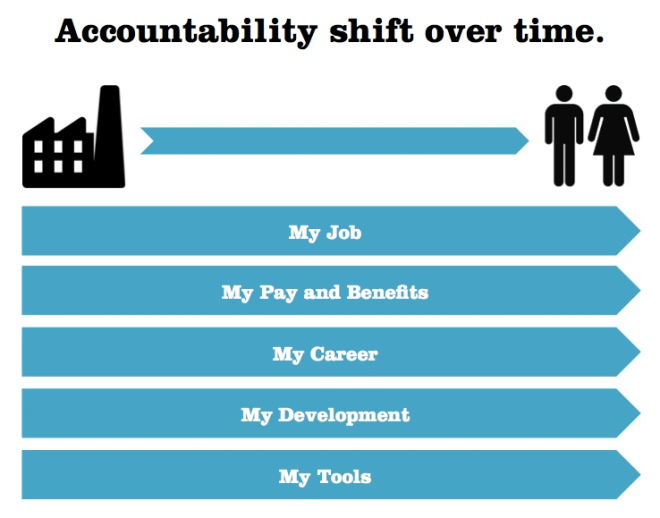 The image below illustrates how accountability for our working "status" has shifted from the company to the individual. I can no longer rely on a career for life. I am now expected to manage my own development. The company no longer provides core benefits, simply a cash lump sum, which I use to buy the benefits that suit me. And in more recent attempts to reduce the organisations’ asset burden, I’m now encouraged to provide my own hardware - Bring Your Own Device they call it. The strange thing is, that even though the main catalyst for change has been the advancement in technology, the solutions that support the employee/employer relationship seem woefully inadequate to facilitate the transition illustrated in the image above. And nowhere is this more obvious than in the way we treat and manage employee data. Any reasonable sized organisation with an employee payroll numbering 10,000 or more, will probably have an HR technology stack from the likes of SAP™, Oracle™ or Workday™, or a combination of some or all of these. Whilst these companies all have ‘SaaS’ offerings, and purport to manage your "end to end human capital processes” (Yuk! ), they are not new businesses, or solutions. Even workday is 10 this year, its architecture being built very much in the shadow of its competitors. And in general, the model hasn’t changed; the organisation owns the software, the software is designed around the organisation, not the user (The employee, candidate or alumni), and probably most importantly, it keeps and manages the data. But this doesn’t help me, the individual, lead the increasingly personally accountable career I’m now having to live. How can I manage a ‘flexible’ career when all of my work accomplishments and achievements decay and die in an instance of Workday™ when I leave my current employer? The answer is I can't. So I’m faced with pulling it together with bits of software from third parties within which I can punch in my payslip history, manage my insurance details or record my achievements. But why should I have to do this? And who’s data is it anyway? Data ownership – If I’m responsible for managing my own career and development, I need the data that goes with it. As an employee, why can’t I own, or at the very least co-own, my employment data? Why can’t I use a single solution, or collection of core apps that simply ‘plug’ into the organisations slimmed down enterprise hub? And why can't I take it all with me when I leave? Data structure – More and more information that defines me as a person, and my potential, is "unstructured": My social updates (internal and external), my blog, my online community posts, the papers I’ve written, my check ins, my likes, my recommendations and endorsements. The list goes on. This unstructured content is rapidly emerging as a core element in big data and predictive analytics, so why isn't it a core element of my employment profile? The concept of #BYOS isn't new, but the conversation up to now has been around using apps to work alongside or around enterprise HR/Talent solutions, and to perform tasks, such as file transfer or note sharing etc. If the above issues are central to the future of the employee data management landscape - which I think they are - what is the implication for enterprise HR/Talent software when even the very best in class solutions would struggle to deal with these two fundamentals? I see a future where I own and manage my own data through my own mini 'portable' enterprise employee portal in my pocket. The problem is, I don't think the major vendors see it the same way.